Have you caught the bug? I have. Symptoms include having 3 or more of the following accounts and checking all of them at least tri-weekly: Facebook, Google+, YouTube, Twitter, LinkedIn, Tumblr, WordPress, eBlogger, and (of course) Flotrack. (note: please comment and add anymore sites that you think are worthy of being in this description as I’m sure I’ve left out a few big ones). …ALSO, when you check the “news” it means you go to Mashable.com. If this sounds like you, then you might be a runner with a social media problem. I was self-diagnosed about 8 months ago when I became addicted to Twitter. Now I spend my days with an itchy finger on my MacBook’s track pad, frantically scrolling through Tweets with multiple browsing windows open to bitly, YouTube, and Facebook all cluttered across the screen. “Screw HootSuite!” I mutter to myself, “I like signing into all of my different accounts!” How many views did that YouTube video get today? I click the refresh button over and over intently staring at the numbers on the screen. Sick. Over time, the illness seems to worsen and I’m afraid many in the younger generation have already become infected. But is this “social media disease” really a threat to our society? Are blogging, tweeting, and checking Facebook for hours each day hurting our running performances and making us hermits with no interpersonal skills? Perhaps, but I beg to differ (and please comment with your own opinion on this). The main point of this post is to argue that one should embrace social media (and admit, as runners driven by innovation and progression, that the obsession has some major power to do good in this day and age). Disclosure: Am I a social media expert by any means? No! I simply qualify as a runner with a social media problem because I have 8 of the 9 accounts listed above in that nifty definition that I just made up – AND I’m totally addicted to Twitter. 1. Social media is for geeky losers who can’t form real life connections so they hide behind a computer screen making faux friendships and chat via public tweets in a feeble attempt to feel important. 2. Personal blogs are merely online journal entries that cry for attention and approval. They are narcissistic and full of meaningless rants that nobody, besides the author, should even care about or want to read. 3. Status updates and tweets about oneself are annoying semi-public announcements that fill feeds like spam and are (at best) thoughtless, materialistic garble. This last one I am definitely guilty of as I love to mention my latest workout, race PR, and that awesome, extremely healthy (or unhealthy) snack I just made and ate. Wow, pretty harsh on those points, huh? This may be a generalization but it seems like a lot of the critics that support these points are part of an older, more conservative generation. You’ve got some Baby Boomers and even a few Gen Yer’s that aren’t too fond of the “Interweb” (as some have been known to call it). There are also those anti-technology purists from Gen X who like to think that they can avoid the evil contamination of Wifi. Fast forward to today and you have Nick Symmonds auctioning off a piece of his arm for a Twitter handle on eBay. 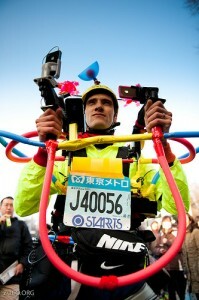 And lets not forget characters like Joseph Tame running around with 4 iPhones strapped on so he can broadcast a live stream of the Tokyo marathon while he participates in it. So what is the point here? Why is social media good for us runners? Shouldn’t we be like Quenton and go train in the woods without electricity? What about living like in Thoreau’s Walden? I highly value the meditative properties of a non-materialistic lifestyle that one can experience when they go “off the grid” to lead a simple life without the clutter of electronics. However, I also value the connectedness and ease-of-access to a plethora of informative content that social media enables us with 24/7. I think (and feel free to disagree) that we should embrace social media and utilize it as a source of support, inspiration, and interaction within the running community. The young runners of today can check in on exactly what Rupp, Ritz, Desi, and Hasay are up to thanks to sites like LetsRun, Flotrack, RunnerSpace, Twitter, and Facebook. Video streams of live race results cover many of the major college and high school races (like the Brooks PR Invite this Sunday 2/26/12 in Seattle. Now only if we could’ve had the Olympic Trials Marathon shown live!). Post-race interviews and training videos are posted for all competitors, fellow runners, and family members/fans to view. Shoe reviews, race recaps, and marathon training regimes are posted on individuals’ blogs; many are entertaining and informative reads. Such interaction strengthens our sport of running and unites us in different ways than the camaraderie of direct competition and conversation. So yeah, I’m going to continue to tweet away and add links throughout my blog posts in a direct attempt to build my digital footprint. The applications to leave a mark on the web are here to stay and shouldn’t be totally ignored or scorned. I encourage you to go out there and find a new blog to read or a new YouTube channel to subscribe to, and derive value and entertainment from the works of others. Having a bad experience with egotistical posts and trolling comments laced with spam shouldn’t discourage you. View the web as an open interface and seek fresh perspectives on what we share, not only as fellow runners, but as fellow humans.